The underlying problem with the debate about euthanasia is the nature of the media machine itself. Assisted suicide makes good programmes and good copy simply because, thanks to the robust law we have, it is a very rare occurrence. Only 1 out of every 50,000 Britons who have died over the last ten years has done so in the Switzerland’s euthanasia centre ( Dignitas), but every one of them has been reported, while the other 49,999 have gone unremarked – for precisely the same reason that the very occasional air crash makes the headlines while the hundreds of thousands of safe landings are ignored. As Bernard Levin once said, you can be quite sure that, if you read about something in the papers, it’s a very rare occurrence. It is also the case that news and other factual reporting is taking on the character of entertainment, It is no longer seen as enough to report what is happening. Readers’, listeners’ and viewers’ appetites have to be whetted by trailers, dramatisations and carefully-arranged visual effects. As the late Malcolm Muggeride used to say, quoting Blake, ‘they ever must believe a lie/who see with, not through, the eye’. Rt.Hon Lord Patten of Barnes CH, Chairman of the BBC. Mr.Mark Thompson, Director General of the BBC. 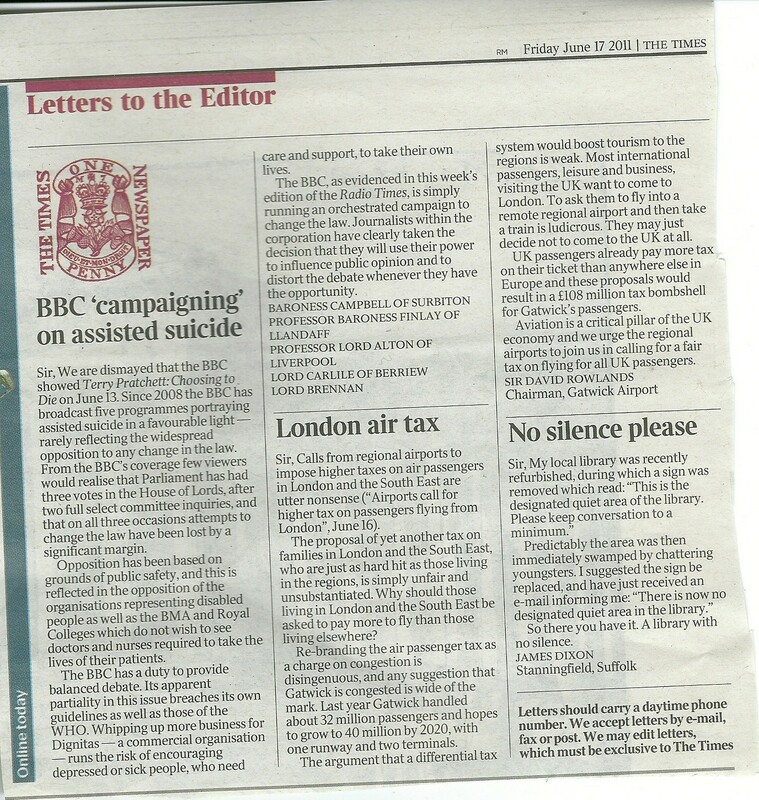 We are writing to you to express our profound dismay that BBC 2 broadcast “Choosing To Die” on Monday June 13th. As you are aware, the programme was presented by Sir Terry Pratchett, a long time campaigner for assisted suicide. Since 2008 the BBC has broadcast five programmes portraying assisted suicide in a favourable light – rarely reflecting the widespread opposition to any change in the law. Indeed, from the BBC’s coverage few viewers would realise that Parliament has had three votes in the House of Lords, following two full Select Committee inquiries, and that on all three occasions, attempts to change the law have been lost by a significant margin. Opposition has been based on grounds of public safety and this is reflected in the opposition of the organisations representing disabled people as well as the British Medical Association and Royal Colleges which do not wish to see doctors and nurses required to take the lives of their patients. The BBC, however, seems indifferent to parliamentary opposition, or the views of those who oppose a change in the law on grounds of public safety or for ethical reasons. These were set out with great clarity in a letter sent to you by a disabled lady, Mrs. Ann Farmer, and which she copied to us (Appendix B). Setting aside our repugnance that the death of a patient with motor neurone disease should be turned into a form of voyeuristic entertainment, the BBC has a duty to provide balanced debate. It is not the job of the Corporation to become a lobbying organisation or a cheer leader for those who wish to change the law. The partiality which this systematic campaign has involved breaches your own guidelines as well as those of the World Health Organisation. Whipping up more business for Dignitas (which is a commercial organisation and has been the subject of police investigations) runs the risk of encouraging depressed or sick people, who need care and support, to take their own lives. Lest you feel we are exaggerating please take the time to look at the schedule of interviews and contacts who were used at the time of the recent referendum in Switzerland (which we have attached in Schedule A) and ask yourselves where was the balance or objectivity required of a public broadcaster. The BBC – as evidenced in this week’s disgraceful edition of the Radio Times, is simply running an orchestrated campaign to change the law. We are not suggesting that this is a decision which has been taken by senior management or the Governors but a network of journalists within the Corporation have clearly taken the decision that they will use their considerable power to influence public opinion and to distort the debate whenever they have the opportunity. We have taken the trouble to raise these matters on previous occasions – but to no avail – and would, therefore, be grateful if a full inquiry into these complaints could be held and our concerns laid before the Governors. We will await your reply. Lord Carlisle of Berriew, Q.C. Lord Brennan of Bilbury, Q.C. Richard Jackson from Portsmouth says people with incurable diseases should be given the choice to end their suffering. etc Ruth Schdubli whose husband chose assisted suicide 6 years ago. Lesley Close is patron of the group Dignity in Dying here in the UK. She accompanied her brother, John at one of the clinics in the country, Dignitas, near Zurich, in 2003. She is now with me here in the studio. 1000am News Channel 2’30 phone interview Bernhard Sutter, is from Switzerland’s biggest assisted suicide organisation Exit. The credentials of the witness(es) have been verified. The text is verbatim. The opinions are those of the interviewee(s). CUE: Voters in Zurich in Switzerland will decide in a referendum today whether to ban assisted suicide, or to restrict the practice only to the city’s residents. There have been calls for a tightening of the laws because so many foreign citizens go to Zurich to die. Richard Jackson, from Portsmouth, had a father in law who was a terminally ill cancer patient. He says people with incurable diseases should be given the choice to end their suffering. “My father-in law died a year ago of inoperable bowel cancer. He endured countless medical procedures to prolong his life, to no avail. Exhausted by the treatments and in excruciating pain he decided to decline further medical assistance. If he had the strength he would have ripped out his medical tubes. He wanted to die. It took 12 weeks before he finally passed away. Our family pet, a dog, had a heart condition which had been controlled by medication for some months. Suddenly it took a turn for the worse and collapsed one day. Our local vet gave the dog a massive dose of tablets followed by a lethal injection. The dog passed peacefully away. In our case the doctors could do very little except provide pain relief. Doctors help patients to die. They give them huge doses of drugs knowing it will shorten their lives. They should be able to do this without fear of prosecution. Voters in Zurich will go to the polls later today to decide on two proposals related to assisted suicide. The first — a complete ban — looks set to be defeated. But the second, which proposes limiting assisted suicide to Zurich residents only, could get more support. Many Swiss people are concerned that foreigners have been coming to their country to die because assisted suicide remains illegal in their own countries. The people of Zurich are going to the polls this weekend to vote on measures which could restrict, or even ban, assisted suicide. Concerns about so-called suicide tourism, in which foreign patients come to Switzerland to die, have led to calls for the country’s liberal laws on assisted suicide to be tightened up. The people of Zurich are going to the polls this weekend to vote on measures which could restrict, or even ban, assisted suicide. Concerns about so-called suicide tourism, in which foreign patients come to Switzerland to die, have led to calls for the country’s liberal laws on assisted suicide to be tightened up. It’s thought more than a thousand foreigners have travelled to the Dignitas clinic near Zurich, including over a hundred Brits, many with terminal illnesses. This is not, say campaigners against assisted suicide, an image Switzerland wants. Ruth Schdubli’s husband chose assisted suicide 6 years ago. Diagnosed with Alzheimer’s, Edward Schdubli wanted to die while he could still recognise his wife. He did so, with the help of an assisted suicide organisation. It was a decision she supported. Davina Hehir (pron Hair) is the Director of Policy at Dignity in Dying, which believes everyone should have choice and control to alleviate suffering at the end of life. Davina Hehir (pron Hair) in our Westminster studio. Letter to Lord Patten of Barnes CH from Mrs.Ann Farmer. I am writing to express my deep concern, as a disabled person, at the BBC’s broadcasting a documentary on assisted suicide today. I am concerned that vulnerable people will be attracted to the idea of suicide as a solution to their problems, and that those closest to people who might be so attracted will themselves feel obliged to acquiesce in their suicide. I believe it will also utterly depress anyone suffering from such debilitating diseases and fill them with dread. It has already been suggested, in a letter to the Daily Telegraph, that the resources being put into caring for people with such diseases should be re-directed to giving sufferers assistance to end their lives. The fact that advocates of euthanasia/assisted suicide now openly call for sick people to be killed or to be allowed to kill themselves is due in no small measure to the fact that in recent years the BBC has broadcast 5 programmes showing assisted suicide in a favourable light. This is despite complaints from people like myself whose quality of life is already poor, who are already depressed, and who are vulnerable to being seen as burdensome. In so doing the BBC has breached its own guidelines on suicide and those of the World Health Organisation; it has been described, accurately in my opinion, as acting as a ‘cheerleader’ for assisted suicide. The fact is that assisting an individual to commit suicide is illegal in this country, thus the BBC is guilty of encouraging a crime, that of its nature affects the weakest in society. Moreover, the BBC would not broadcast programmes advocating that able-bodied people should commit suicide, thus it is also guilty of discriminating against a vulnerable minority. As an organisation that influences not only British but world opinion the BBC has a duty to uphold the law and avoid encouraging discrimination against groups like the disabled. As Chair of the BBC Trustees I beg you will do all you can to ensure that this approach is curtailed forthwith, and that the BBC should portray disabled people in a positive light. ← The Plight of Pakistan’s Minorities – Ahmadis, Christians, Hindus, Buddhists and Zoroastrians facing campaign of relentless violence.. Thank you to all the writers of this letter and to Mrs. Ann Farmer. The bias of the BBC almost amounts to victimisation of the vulnerable. It is strange how nowadays protection is only sought for the violent by people who pride themselves on their humaneness. They ignore or wish to dispose of, or better still force other people to dispose of, unborn children, especially disabled unborn children, depressed young people and disabled people, which now by law includes terminally ill people, and old people in general.